Now SportsGraphics does large digital print on unlimited surfaces. Amazing custom graphics are available at unbeatable prices. Let SportsGraphics' design team reveal the uniqueness and quality of your product. Not only do they use the highest quality printers and material, they also put creative strategy into communicating the kind of message you need to deliver, giving you the results you need. Let SportsGraphics help you reach your goals and get the attention your business or product deserves. Aquatic Technology Inc.'s flags and pennants are made of high-grade vinyl. The durable pennants measure 11.5 inches wide and 14 inches to point and meet all FINA, NCAA and USS regulations. Printed using high-quality UV-resistant inks, Aquatic Technology's flags and pennants can be customized with individual letters, numbers or even images such as logos. For ocean beach flags meeting worldwide standards, Aquatic has a wide selection. For aquatic teams, pennant and backstroke flags are available in assorted colors, sure to meet any color scheme. Economy pre-strung vinyl flags that measure 9 inches by 12 inches in lengths of 60 to 120 feet are also available. Olympus Flag & Banner manufactured 10 foot by 5 foot banners for the University of Wisconsin. The banners featured each player from both the men's and women's basketball team, individually. The banners were dye sublimated on polynylon and displayed throughout the stadium. Olympus specializes in traditional screenprinting, digital printing and appliqué services. A wide assortment of materials is available. Olympus Flag & Banner has been creating championship appearance banners, commemorative banners and street banners for more than 100 years, providing sports and fitness facilities with eye-catching designs and quality products. Roll-A-SignTM , a division of Reef Industries, is a disposable, plastic banner ideal to promote your company or special event. Manufactured of premium-quality, weather-resistant 6 mil polyethylene film, Roll-A-SignTM is available in widths of 18 inches, 24 inches or 36 inches with four-spot colors. Roll-A-Sign'sTM high-strength material provides superior tear resistance with an exceptional ability to withstand extended exposure to weather conditions. 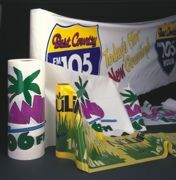 Since Roll-A-SignTM is a disposable material, just throw away after use.